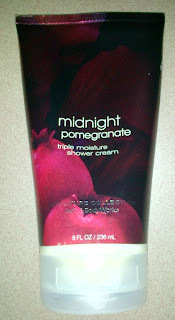 Product Description: Our Midnight Pomegranate Triple Moisture Shower Cream is the ultimate luxuriously moisturizing body cleanser. With rich, creamy moisture and a gentle ki*s of fragrance, this pampering treatment works hard to nourish skin while you shower. With natural soybean oil and our exclusive Triple Moisture Complex of milk proteins, rice bran oil and acai berry, it leaves your skin feeling deeply moisturized and soft as silk. You have to feel it to believe it. 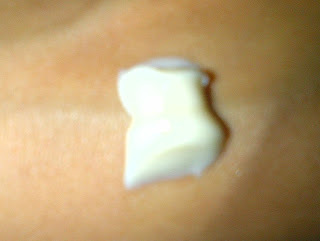 Texture: It's butter whipped to it's thickest smoothest texture :) Just soft, smooth and slippery. Fragrance: It has a fruity+ floral smell. I cannot describe it exactly but I can say that it has a soothing fragrance which relaxes the tired senses after a long day . Love the smell :). But but but... it doesn't last at all. The smell lingers hardly for an hour. Cleansing: It feels like a hair conditioner, very slippery and needs more water to rinse off. I don't get the squeaky clean feeling with this shower cream. Moisturization: This is the factor that scores amazingly. Skin does feel smooth like silk and in summers and monsoons when my skin turns dry to normal I don't use a moisturizer after bath. However in winter one needs moisturizer because of the dry weather. Availability: Not available in India. I picked it up from US. Nice work with this review. I am always interested in trying out new products and its hard to find out which ones are good and which are bad. Thanks to blogs like yours I can make a more informed decision. Any idea about parachute body lotion? Been reading great things about it.. would love to see a review by you! I really do enjoy your blog posts and reviews a lot! Please take your time to do the review. I have heard and read a lot of people talking about how well the parachute body lotion has worked for them and it would be nice to see a review of it by you too! Have a great day!